A week after JVP Member of Parliament (MP) Sunil Handunnetti lodged a complaint with the Jaffna police over the assault on him and his colleagues in Jaffna, no arrests have been made. Headquarters Inspector (HQI) for Jaffna, Chief Inspector Saman Sigera told the Sunday Times that investigations were continuing, but no arrests have been made to date. Mr. Handuneththi told the Sunday Times that, despite his colleagues coming under two separate attacks in Jaffna, on Sunday night and Monday afternoon, no action had been taken to make any arrests. “We are directly blaming the Government for using a section of the military intelligence men in the attack. We have taken photographs of some of those involved in the incident. However, no action has been taken by the police to identify them”, he said. He said that, party members including its leader Somawansa Amarasinghe, General Secretary Tilvin Silva, former MP K.D. Lalkantha and Jaffna district organizer Lalithkumar Veeraraj were in Jaffna to collect signatures for a petition to divulge the names of the Tamil detainees. “On Sunday evening, we visited the Udayan newspaper office and gave a newspaper interview. On our return, we were followed by persons in civvies riding motorcycles and in three-wheelers. We arrived at former TNA MP Padmini Sithambaranathan’s residence in Kandarmadam, close to Jaffna town. Within five minutes, a group broke into the house and started attacking us”, he said. He said that, they used pieces of furniture to attack them, and later used wooden planks with nails driven into them from both sides. “They spoke in Sinhala, and asking who was Lalith (our Jaffna organiser). I tried to speak to them, saying that I was an MP. But they kept attacking us”, he said. “When pandemonium broke out, people from the neighbourhood came there. The attackers fled the scene in their vehicles parked outside the premises. 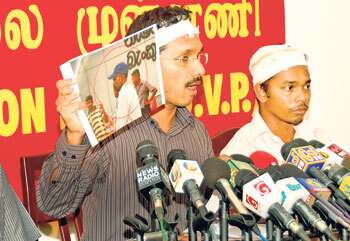 I telephoned the Jaffna police and informed them of the incident, and they recorded our statements”, he said. “Jaffna HQI Saman Sigera visited us in hospital and appealed to us to leave Jaffna, saying they were helpless”, he said. Ms Sithambaranathan told the Sunday Times that the JVP members visited her home around 7:00 pm and sought her assistance for the campaign. She said that, when the meeting was in progress, unidentified persons entered the main hall and assaulted the JVP members. “My relatives saved me by taking me away from the main hall. Some of my furniture was damaged”, she said. She said the Jaffna police visited her place on three occasions and obtained statements. On Monday, when the JVP members commenced their signature campaign close to the Jaffna town, some 200 women turned up and appealed to the JVP members to help them find their missing kith and kin, and release details of the detainees. Mr. Handunnetti said that, as the protest was drawing to a close, a group of men clad in civvies arrived and started throwing eggs, tomatoes and stones, forcing the gathering to disperse. “The incident took place while the police watched, but no arrests were made at that point”, he said. He denied Government claims that the attackers were Tamil people in the north. “On the contrary, it was Tamil people in the north who helped us after the assault”, he added.